A Texas-based developer and a local partner have purchased a chunk of the Broadway Station site, and expect to break ground early next year. 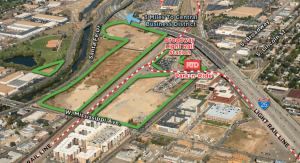 Austin-based Endeavor Real Estate Group said Wednesday that it and Denver-based Legend Partners have purchased 7.5 acres of the 41-acre redevelopment site, where a rubber factory once stood, from Broadway Station Partners. Endeavor Managing Principal Charlie Northington said the land the companies purchased is northwest of the intersection of Broadway and Mississippi Avenue, east of the railroad tracks. The companies paid $32 million for the land, according to county records. Northington said the companies plan to build five or six structures at the site. The current thinking is that two will be office buildings — which would be about eight stories high — while three or four will be apartment buildings, which would top out around five stories. All the buildings would incorporate ground-floor retail space. That would translate to about 100,000 retail square feet, 400,000 office square feet and upwards of 900 apartments, Northington said. But he said the building mix isn’t finalized, and the companies could decide to build more office than multifamily. “It just depends on demand,” he said. All the buildings likely will have one level of underground parking, in addition to above-ground levels, Northington said. He said the company expects to break ground next year, likely starting with one apartment complex and one spec office building. It could take four to six years to build out the 7.5 acres, he said. Northington said executives with Endeavor, which has been most active in Texas, sat down about four years ago and picked four cities that they wanted to enter, largely because they were similar (or becoming more similar) to the company’s hometown of Austin: Nashville, Denver, Salt Lake City and San Diego. The company since has secured a site in Nashville where it is building a 20-story office project and now, with the Broadway Station acquisition, has checked two of its target cities off the list. Endeavor has completed one other project in Colorado, the renovation of a retail center in Colorado Springs. 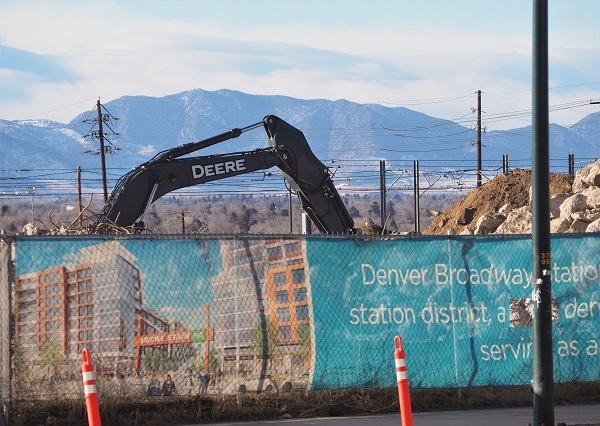 In Denver, Endeavor is teaming up with Legend because executives from both companies previously worked at Trammell Crow Co., and because the companies have collaborated in the past, Northington said. Endeavor has hired Denver-based Shears Adkins Rockmore as the master architect, while Los Angeles-based Rios Clementi Hale Studios will assist in the design of the office component. Kimley-Horn has been engaged as the civil engineer. Legend Partners will lease the retail space, while JLL will market the office space.